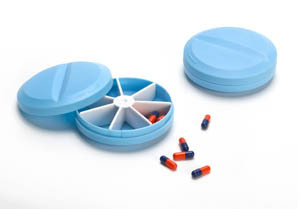 Pillbox is a contemporary designed pill box for carrying and organizing your pills anytime, anywhere. Shaped like a large tablet, this travel essential has an internal divider to organize your daily medication and make sure that you never miss a pill. You can also remove the divider to store other small items inside. Available in white, pink and blue, this cheerful pill organizer will sweeten even the bitterest of pills.